Jeff Stamps: "Consciously living with dying"
Two years ago today, my husband Jeff Stamps learned that he had Stage IV pancreatic cancer, a fatal disease (overall survival rate of less than 4%, according to cancer.gov). Jeff lived 13 months against an initial prognosis of 3-6 months, given the late stage of disease. Most pancreatic cancer is detected at the same stage as Jeff's. The pancreas lies deep in the body, behind other organs; typically the symptoms of "pancreas cancer" (how his oncologist always referred to it) don't present until something dire has happened, as was the case with Jeff. This anniversary (indeed all that surround a death) is not the easiest of days. The tendency to relive the hours, recall the details, and wrestle with the absence is compelling. It's hard to know what to do with the maelstrom. One way is to publish Jeff's own words about this day. Herewith the opening section of "A Dangerous Experiment," his memoir, which he began seven weeks after Diagnosis Day. On May 5, 2010, I went to my physician with a “stomach complaint.” By four that afternoon, I learned its origin: Stage IV pancreatic cancer. My life went from looking into an indeterminately long future to anticipating its end. This is my experiment in bringing awareness and openness to life’s greatest challenge. Naturally, it’s unavoidably fraught with the deepest emotions. There are real possibilities for joy and growth together with the ever-present risk of despair and contraction into a stunted psyche. I text my wife Jessica with the news. She’s finishing a meeting at a local coffee shop and I have to pick her up. By the time I arrive, she’s prepared for us to go to the Beth Israel Deaconess Emergency Room. “Pack a bag,” she says. It’s an announcement, not a suggestion. “Tom says we need to go to the ER to get some tests.” Tom Lamont, a next-door neighbor of 38 years and close friend, is Chief of Gastroenterology at the hospital. I listen to Tom. The ER attending physician comes to the small cubicle where I’m being held until some determination is made of my condition. He stands with his back to the wall and looks down. “This is why I hate being a physician. This is the worst part of the job. This is really awful.” He goes on this way, talking about how difficult it is to say what he’s about to say, but not saying it. “Possible pancreatic cancer,” he mumbles. He’s ordered a CT scan. He is gone in a minute. Leaving the cancer diagnosis hanging, the doctor addresses the immediate problem: the blocked bile duct clogging up my system and causing significant distress. I will be admitted to the hospital. Someone in Tom’s group will insert a stent in my bile duct the next day, open it up, and relieve the pressure. What does the diagnosis mean, I wonder? Until age 65, I am the picture of health with the ignorance that goes along with that. I don’t know where pancreatic fits on the cancer spectrum. It isn’t sounding good, but really, how bad could it be? On the other hand, stage IV of anything is definitely not good. From the moment I’d texted her, Jessica has been searching online. She is far more medically savvy than I am, and by the time the radiologist types “panc head,” she’s already figured out that this is what it might be and has an idea of what it means. Incurable at any stage. Most people (80 percent) are diagnosed at Stage IV because it is the symptoms of already advanced cancer that force people to the doctor. There are no tests for early detection. Jessica has already contacted our daughters, Miranda and Eliza, who live in Brooklyn. By the time we get the CT report, the girls are on their way to Boston with Lake and Finn, Miranda and her husband Jay’s eight-month-old identical twins (Jay will shortly). We ask the doctor to put the phone on speaker, and are daughters are getting the news as we do, listening while driving north. Over the long hours it takes to get a hospital bed, we have a lot of small talk; I get drugs for my symptoms. Jessica isn’t saying much about what she’s learning, although at one point, as I’m probing for how serious this might be, she tosses out five years in some unclear context. Ok, it’s serious, I think. But I’ll wait for the full evaluation to decide how worried to be. I don’t yet know that the CT scan is so clear, so conclusive, that I am already being treated as if I have a confirmed diagnosis, which usually requires a biopsy. It’s nearly midnight before I’m admitted, traveling the two blocks from the ER to the main hospital by ambulance. I have a terrible night. My roommate is very loud. His IV machine beeps constantly, and, as we are at the end of the hall, the squeals persist for a long time before a nurse arrives. And by now my bile obstruction really hurts, and I’m squirming in the bed to find a tolerable position. As I’m curled toward the window, Tom walks to a point between me and the light. All I see is a tall figure with a long white coat, the face shadowed, featureless. He talks. All I hear is one phrase, “…and some of my patients have lived as long as a year.” It was, Tom tells me a few days later, in tears, the most difficult moment in his professional career. I am terminal with months to live. Now I know with clarity. After Tom leaves, the day becomes a blur of activity. Nurses, interns, and fellows precede the surgeon, Mandeep Sawhney, who is my “care coordinator” for the day. Jessica and the kids arrive. Surgery to open my bile duct with a stent takes longer than expected because of the size and position of the cancer mass, and no biopsy is taken. I am in pain and drugged as I am wheeled back to the hospital room following surgery. Not long after, a young oncologist shows up, advanced by a fellow and trailed by interns. Next steps are pretty clear: A course of two rounds of chemo followed by a CT scan to see how I respond to the palliative, not curative, drug. Treatment options, few as they are, would follow. The normal prognosis for untreated progression from the point of my diagnosis is 3-6 months. Successful chemo adds 2-4 months. Thinking positively, that offers a 5-10 month probable window of life. Every day has just become very precious, but I’m not focused. I’m still having a difficult recovery from the surgery. I flicker in and out of conversations as my people visit—my sister, Susan, and close friends, Kate and Ben Taylor and Jean Nichols. It doesn’t take long for Jean, a PhD microbiologist, to deduce from my appearance and behavior that I probably have a post-surgical infection. She calls Tom with her suspicion; he calls the hospital; and soon I’m on IV antibiotics. It is well into the early morning before the pain subsides and I drop off to sleep. By late that afternoon, I am home. How did I feel when a dear friend tells me I am terminal? I have been processing the incoming news about my condition since the ultrasound, so I am not surprised. But, the time frame is considerably shorter than what I expected. For reasons I cannot fully understand, I move to acceptance. This acceptance does not feel passive. I snap into a new reality, a moment that becomes a point of action. Acceptance begins a unique period of consciously living with dying. My calm seems real, but my mind is racing to unpack how I must really feel. Fatal and fast-growing, this cancer is no ordinary diagnosis. This is a once-in-a-lifetime test. How did I get to the place of acceptance? I wonder where denial and anger are. Familiar with Elisabeth Kubler-Ross’s work on the stages of grief, I test the expected emotional pathways. First, I am not expressing denial. No one around me is denying it, no family or friends or medical professionals have expressed mitigating possibilities. Here we are all helped by the clarity of the CT data to the doctors. Moving beyond denial, I am enormously lucky that a trusted doctor provides the prognosis quickly. There’s nowhere to hide. A new reality bounds my life. More surprisingly, there is no anger. I am no stranger to that emotion, having struggled mightily with it over the years. Here it seems absent. At 66, I don’t feel cheated or robbed of time rightfully mine. Nor do I feel sentenced for some misdeed or punished for a badly lived life. Besides, no one suggests that anger helps at all. It is just a waste of time. This no-anger attitude, never complete, persists and has a big effect on my psychology, social surrounds, and, I believe, avoids negatively impacting my chemical physiology. Then there is no bargaining. I accept the diagnosis. However, within the Stage IV context, I will have choices, even if treatment options are limited and in any case are palliative not curative. Some basic decisions fall into place. Yes, I will follow treatment to maximize the prognosis, but I will choose with high consideration for the quality of my remaining days. I will aim for a conscious death at home. Although I’m open to all options, I will not rush around trying every cure, trying to buy a few more weeks. What I will do is offer my body and the therapies applied the best possible mental attitude for their success. Depression, too, is largely absent. Intellectually, I understand why it appears in the gap between bargaining and acceptance when the bargain is lost. Often, the dying person begins to shut down his or her social network and retreat into grieving. I find myself, naturally an introvert, opening up to an ever-larger network—family, friends, even people I know only tangentially. Finally, acceptance. I still cannot fully fathom how I am able to reach this point: calm and clear. Even after examination, I feel this acceptance with no hint of passivity. It’s an acceptance that frees me to live intensely and in the moment while preparing for death. This active, every-day-is-precious acceptance also permeates the new intimacy I’m developing with my nearest and dearest. Don’t get me wrong. While the stages did not unfold in the prescribed manner, there was and is grieving. Sometimes I cry a little with Jessica, or the kids, or with a friend as they grieve openly, usually briefly (with me). Sometimes the grieving comes on unexpectedly. Six weeks after my diagnosis, I am driving our boat across Lake Winnipesaukee in New Hampshire with the whole family onboard. We are on a day trip to open our rustic island cabin on a piece of paradise connected to my earliest childhood memories. I find myself sobbing across the waves, no one aware over the roar of the engine. Grieving is a part of life. One other feeling stands nakedly before me upon reaching terminal acceptance: Fear. You can’t fake it, not to yourself, particularly in the quiet moments, or the dark of night. How I hold fear will have an inescapable guiding influence on my inner experience of progress towards death. For me, blessedly, so far fear has been largely absent. Indeed, old fears about dying in old age have disappeared. Most especially I will not die like my estranged father, who at 91, may well outlive me, albeit gripped by late-stage Alzheimer’s dementia and depression. Long life is not always wonderful. These are the emotional “facts” as best as I can describe the indescribable. These feelings and their respective absences are all simultaneously present in the early morning light of my “terminal initiation.” Even as I experience “not-denial,” “not-anger,” and “not-bargaining,” I wonder why. Maybe the shock and denial are so massive I am dissociating from reality. Yet the emotional state that comes on in the hospital remains fairly stable as I approach the two-month mark and the beginning of this memoir. For me, the word that best describes my state is equanimity. What brings me to equanimity? I do not know, but I hope to understand more through this exploration of my Terminal Bardo. That first Friday night home from the hospital is not so good, but not too bad. The next morning I get up early as usual, and stumble upstairs to my third-floor study. I have had a third-floor place of work and thought since 1968 when I sat atop 46 Leckford Road in Oxford (famously occupied by Bill Clinton who moved in when I moved out). From that perch, I looked out my window across the famous spires of Oxford, often shrouded in wisps of fog. Those years as a Fulbright Scholar, co-founder of Oxford’s American anti-war group, and student of Thomas Hobbes and systems theory, were formative. Most importantly, it’s when Jessica and I met. Since 1972, my third floor has been of an eighteenth-century Early Georgian house (c. 1723) on a park-like acre of land in Newton, Massachusetts. We had just married and were looking for a place to settle in the depressed housing market of the early 1970s, when no one wanted a really old run-down house. Raised in houses of this vintage in New Hampshire, I saw home. And so it has been ever since. I have an easel of my own making, a standing board covered with butcher paper that overlooks the yard. This is where I externalize my thinking, recording thoughts and events, outlining tasks, drafting plans, writing notes, and making sketches. I have a pictorial history on “big white sheets” going back three decades. On that day’s sheet I’ve written in red pen: ”May 8. Diagnosis: PANCRATIC [sic] CANCER. Stage 3 or 4. Months to live.” In green, “WHOLE FAMILY HERE. Kids and grandkids staying. Will be an amazing time.” I can’t even spell the name of the cancer. And, yes, it is an amazing time as family and friends converge. We had just become a multi-generational household. Again. Except now I am a new grandpa. Miranda has decided to work from here and is staying on with the twins as has Eliza while Jay becomes the bi-city commuter. From the moment I text Jessica with my symptomatic diagnosis, I have been surrounded by caring people. This social blast is greatly heightened by all the extra activity occasioned by the twins. First, of course, is the care required of two tots. Then there is the fact they are incredibly cute and everyone wants to see them. Many friends and friends of friends flow through as Miranda and Eliza grew up here in this house. On Monday night we attend our regular book club across the street at Tom and Emily’s house. Tom, yes, GI Tom, and Em had started this group with several others twenty years earlier. We are newcomers, only ten years into it. It is a highly emotional evening. This is when Tom tells his side of the “terminal moment” experience, with tears, not common to him. Later, the book clubbers ask about my experience, what I think about dying, and what I think of the afterlife. Over the next few weeks, this conversation will repeat many times. It is as about as intimate a conversation as you can have. These are the days of shock and frenetic activity. On Tuesday we begin the process of deciding what to do with our speaking, consulting, and software business, NetAge. I see my long-time therapist and begin the process of rapid disengagement after ten years of work together. It is clear to me that this very talented Harvard-affiliated psychiatrist cannot face her patient’s new reality. The following day, a week post-diagnosis, finds Jessica presenting a long-scheduled webinar, and then both of us meeting with our financial advisor and an estate lawyer. That afternoon we have our first visit with an oncologist and schedule a course of chemotherapy. Wednesdays are to be our day. It’s only Thursday, just eight days after the diagnosis. I go to my last therapy session. You’d think now is when I need expert counseling, but the therapist hides, in denial, not showing up for the appointment. I go for my prescheduled annual physical with my primary-care physician who has cared for me for over twenty years. My brother David arrives from New Hampshire. The yard and house are full. Friday, the same. As the week progresses, a parallel stream of activity picks up. The Saturday after my diagnosis we are supposed to be in Brooklyn to attend a naming ceremony for the twins. Relatives and friends from around the country are coming. It is, of course, canceled. Well, postponed, really, as we all decide a few days later that we need to go ahead. Miranda and Jay re-conceive and reorganize the event for the forthcoming Saturday in West Newton. It is to be held in the very old Unitarian Universalist church in our local square where we had taken the kids during their tender years and where they both did a “Coming of Age” ceremony. On a perfect spring Saturday morning, Miranda leaves early for the church. Eliza and I follow a little later, walking to the square. We arrive at the church as an unexpectedly large group gathers: Jay’s family, mother Ardis and brother Hunter, from Birmingham, my brother and sister, Jessica’s brother Eric and niece Amanda from Philadelphia, a contingent of friends from New York, and of course long-time Boston-area friends. Many in the crowd know about my condition. Some are just finding out. Birth and death mix openly but do not distract from the event at hand, focused on the miracle twins, Finn and Lake. The lay minister does a wonderful job following and leading the script that Miranda and Jay have laid out for their sons. Everyone, 60 people or so, comes back to the house. It’s a perfect day for an indoor-outdoor party. The ground floor of our house circulates from the kitchen around to an inside porch that leads to an outside patio and the yard that connects back to the kitchen. As the morning-afternoon crowd wanes, new people show up and the party doesn’t really break up until close to midnight. The next morning, a few people arrive for breakfast, more for lunch, and on into the afternoon. On Monday, the previous week’s pace continues. It starts with an appointment with a pancreatic oncology surgeon. Although I am a highly unlikely candidate for surgery, he allows us to get a good high-resolution look at the CT scans that are the basis of the diagnosis, albeit in the sobering context of the cancer being so advanced it cannot be excised. In the afternoon we meet with the estate lawyer. Late that night, Jessica is somehow able to write a blog post, A turning for J&J, that makes our personal situation public. There’s no let up the next day. On Wednesday, May 19th, we meet with Hester Hill Schnipper, an experienced oncology social worker… and I start chemo. My new life on drugs is underway. As the cancer-specific pain has increased over the past week, a complicated set of medications, dosages, and times of application come into play. Now my first infusion of chemo also includes a range of ancillary drugs, some of which I don’t respond to well. Our assigned oncologist doesn’t communicate clearly so we have to learn how to use the meds and sort out their conflicting side-effects from the baseline effects of the cancer and chemo ourselves. Bottom-line, I feel sick most of the time. Oddly, however, I have a good feeling that I will do well with this treatment. Despite how badly I am feeling physically, the following day is similarly packed, including the terminal session of my multi-year therapy and treatment for anxiety. Ironic. That evening we are the guests at a Tibetan baby-welcoming ceremony for Jasmine, daughter of our dear friends Phuni & Wangchuk. We are to open the ceremony and they gently encourage me to tell people of my diagnosis. Tibetans do not shy away from death, and it is natural for a ceremony welcoming life to include a reminder of its end, for we all live with the certainty of death. Jessica tells the group about how we came to know these two remarkable people. I speak to the preciousness of life and preparing consciously for death. Some people appear moved. Most non-Tibetans have not heard anyone talk publicly about their impending death. I look the part as I am in a lot of pain. We do not have the meds figured out yet, and we don’t have what I need with us, so we leave early. Here, at the end, I can be the best role model of my life for my children. Now I can’t backslide. I have to stay the course of equanimity, acceptance of death with zest for life, and a continuing willingness to grow and transform. They hold me to the gift I offer them in the manner of my dying. My unexpectedly calm emotional state is apparently contagious. The courage and grace of my wife and daughters amazes me. We are working together to make this time all it can be. We are all, each of us, reaching down deep and knowing this is a never-to-be-repeated moment. We are making this a signature time of our personal histories. We will make this work for us. Welcome to the official Twitter page of His Holiness the Dalai Lama - administered by The Office of His Holiness the Dalai Lama. The OHHDL would like to graciously thank our Twitter mediator, Deven Hk, for providing insight and logistical information. His Holiness thought it was prudent to make his office open and assessible to a more youth and technologically advancing audience. I agree. And as I've said here, there, and elsewhere, if you have the chance to see HHDL in person, do it. Repeating: there will never be another mature Dalai Lama in our lifetimes and any Dalai Lama who twitters is worth listening to in real. ...Dublin City Council will announce the shortlist on 2nd April 2009 and the winning novel will be revealed by the Lord Mayor on 11th June 2009. Also on the list are Doris Lessing for The Cleft; Junot Diaz for The Brief Wondrous Life of Oscar Wao; and Mario Vargars Llosa for The Bad Girl. The 156 authors hail from 41 countries. The books span 18 languages, 29 of which are translated from languages such as Arabic, Japanese, Russian, Slovenian and Hebrew. 19 of them are first novels. "These are books that might not otherwise come to the attention of Irish readers”, says Deirdre Ellis-King, Dublin City Librarian. “The spread of languages and the number of books in translation continues to grow”. If you're in the vicinity of Bethlehem, Pennsylvania, then you know that the Dalai Lama was hanging around recently. Wrapped up, earlier this week, a six-day "teaching" at Lehigh University, plus a public lecture (see Brandie Kessler's article, "Dalai Lama gives heart-y speech at Lehigh" in The Pottstown Mercury, the paper where I got my start, which ran this nice editorial, "Message of unity needed in the world." When I mention that I've been to such a teaching (see "Transparency and the Dalai Lama," for example), I usually hear an impassioned, "WHAT was it LIKE?" Over the years (have been to four such extended events beginning in 1981 plus a couple of public lectures), I turn to metaphor because it's not really "like" anything else. As I've said before, I'm not a Buddhist; I'm not a "follower" of the Dalai Lama; I'm not even very knowledgeable about Buddhism or Tibet; and I've never been to Dharamsala, India, where he settled after fleeing his home in Lhasa in 1959. But I continue to choose to sit in venues with thousands of others time and again in order to do some deep internal housecleaning, i.e. detailing for the soul. The Dalai Lama, the 14th person to hold this title, is a rigorously trained Buddhist scholar and, if I've got this right, there is endless scholarship to learn. Monks, geshes, lamas, rinpoches and, more recently acknowledged, nuns have been interpreting the writings of Buddhist thinkers ever since the Indian prince, Siddartha Gautama, left the reservation in search of deeper understanding of the world, abandoning a wife and child (for which I, and likely a few of my sisters, have never forgiven him). But, if you get beyond this confusing choice in the life of the person who eventually sat under a tree and attained enlightenment, it's really hard to argue with Buddhism, regardless of your religion, even if the one you're born into (Judaism here) frowns upon "craven images," i.e., having a bunch of stone, wooden, wax, or even lucite Buddhas sitting around your house (ahem). Honestly, I can't follow a lot of it when the Dalai Lama goes deep into the interpretation. Example: this teaching was about "emptiness," which, just to keep the mind nimble, apparently doesn't mean emptiness as in there's nothing there but rather that everything is connected to everything else, thus interdependent, which means there is never just a thing but rather everything that came before it and all that will come after and everything that it connects to in the now, if you can "catch" the now because as soon as you do, it's the before during which time you were probably day-dreaming about the future. The kind of brain teaser that comes up after a statement like that is this: What came before the Big Bang? Ponder that for the rest of the day and post a comment, please, when you've got it sorted. That's just a slight toe into the ontology waters - and I'm not even sure the "study of reality" is the way to put it. What always keeps my attention in these lectures is the material around the self - why we behave as we do, why we put ourselves above others, and what to do about it. In a word, compassion. Put others first and you'll be one heck of a lot happier. One other note to those who are wondering how these sorts of lectures work. In this case, the event took place at the Stabler Arena at Lehigh, a sports facility. The stage was at one end of the space, we were seated at the opposite end, on the side, up a relatively large number of rows. Fortunately, there were two jumbotrons - and, as usual, an extraordinary translator who speaks fluent, idiomatic English. The entire arena, with 6000 people, falls still as the dawn when the Dalai Lama enters, monks, believers, and those who respect the man bringing their palms together and bowing slightly as he does his prostrations and ascends to his throne. Then everyone else sits down, a sea of crimson and saffron-robed monks rippling around him on the stage floor. Chanting ensues in Tibetan for a few moments, though on the last day, a group of nuns chanted an incredible, breathless recitation that captured the essence of Buddhist thought. The Dalai Lama usually then speaks for a few moments in his broken English, without many adjectives or adverbs, without much attention to tense, then reverts to Tibetan, which he speaks for perhaps ten minutes straight, the translator following in astonishing detail, which the Dalai Lama occasionally corrects, evidenced by the translator saying something akin to, "Sorry, not analogy, I mean metaphor." * It's better to keep one's own tradition than to adopt another's. Different traditions suit different people. * We're all on the same planet with the same difficulties. * On a practical level, it's all the same, regardless of tradition: love, kindness, forgiveness, tolerance, contentment, faith. You get the idea. As I said, I've got pages and pages. The Tibetan Buddhist Learning Center sponsored this event, organized the volunteers, and provided a mainly hassle-free experience, given the numbers, the heat, the protestors (yes, there are those who don't like the Dalai Lama, including one rather large national government). Many thanks to Josh and Diana Cutler and friends. Hardly the word. The folks at the Stabler Center also deserve our gratitude. Imagine hosting the Pope for six consecutive days and having him on the stage for two sets - morning and afternoon - or, perhaps more analogously, Mick Jagger. With one exception, a very unhappy ticket-checker, who literally threw a curtain across a doorway in front of me so that I couldn't see the Dalai Lama from a hallway (the curtain was always partially open) and told me to "get out," the staff, including security, were extremely kind and helpful. That angry man needs a lot more time with the Dalai Lama. And, I can't forget the typical close to these events: someone with an accounting background stands up and reads the financials "as of 2:15 today" (July 15, 2008): Total revenues = $1,138,798; total expenses = $1,110,000, expected to rise by the end, with any surplus being donated to "charities approved by His Holiness in New York City." Last of the last: if you're interested in understanding the Dalai Lama, read Pico Iyer's brilliant and gorgeous memoir/biography, The Open Road. Iyer's father was a friend of the Dalai Lama and for thirty years, Iyer-the-son has had more than a passing acquaintance with the man. Superb. And special thanks to the little sangha that came together in our remote arena seats: Julie the choral director, Jeanne the PhD chemist, Chris the anesthesiologist, and Jeff the systems thinker. And to our lunch group: Askold the writer extraordinaire and Richard the professor. And to Anne of the Kindle. My husband, Jeff Stamps, a long-time student of world affairs, politics, and Buddhism, wrote this piece, which I hope you will read. This Easter, my prayer is for the Tibetan people everywhere and for their spiritual and temporal leader, His Holiness the 14th Dalai Lama. This global spiritual force, with his inclusive religious mantra, is an intensely-trained monk from the distant nomadic steppes of Shangri-La, the “roof of the world.” He also runs a government-in-exile from a generously-provided sanctuary in India. The Nobel Peace Prize apostle of non-violence, the Dalai Lama is the Gandhi of our time, albeit with more spiritual depth but fewer political skills. Since his exile, he has held the same “middle way” view: cultural autonomy for Tibet, but not political independence. Today, he struggles with both the oppression of his people by the Chinese and with the now-unconstrained frustration of Tibetan youth demanding independence. Among all of us who love Tibet for whatever reasons, we share a deep sense that time for the Dalai Lama’s “middle way” and Tibet’s very survival is running out. By “Tibet” surviving, I mean Tibetans as an ethnic group with roots deep into pre-history, a people treated as racially inferior (“barbarians”), as a coherent religious group of Tibetan Buddhists, and as a national group of several millennia standing. For the Dalai Lama’s strategy of non-violence to work, the world must find ways to help Tibet and China find a path that provides Tibetans the cultural and local autonomy they require within the Chinese federal system of governance. There are four reasons the world should care about the Tibetan uprising at this time: (1) the preservation of an ancient and abiding culture; (2) respect for a very old spiritual tradition; (3) the act of genocide; and (4) concern for the environment. The terrible events in Tibet of the past few days have me thinking about our Tibetan friends and reflecting on the times we've spent at lectures with the Dalai Lama (HHDL, to his people). I think I've said before here (and certainly in my writing and to my friends) that when it comes to matters of spiritual practice, I tend, like my eating habits, toward omnivorism. If a body of belief espouses peace and justice and taking care of others, I'm in. And, if it is sound psychology, I'm not only in but climbing the stairs. Having spent two weeks in sessions with the Dalai Lama over the past 25 years, I feel confident saying that he is a profound psychologist. His attention to empathy and his call to work toward the happiness of "all sentient beings" resonates. Like many others who've been concerned about the future of Tibet, my heart is breaking: two friends have received first-hand reports, which are excruciating to read, and the news this morning that the Dalai Lama, an unwavering believer in nonviolence, is willing to step down as the political leader of Tibet if that would contribute to the violence coming to an end, make me want to...you know, I don't know what it makes me want to do but it's a lot more than sit here and post to my blog. Some years ago, my husband and I noticed a banner outside an art gallery in Meredith, New Hampshire: "Tibetan Children's Art Exhibit." There we found the most amazing collection of paintings by children who had fled Tibet without their parents (they send them out in hopes of a better life) and resettled in the north of India at Tibetan Children's Village. We looked at the many paintings on the walls and in the many drawers and listened to the story of how these paintings came about. To deal with the trauma they experience during their dangerous journeys across the Himalayas, these kids are offered art lessons once they arrive in India. Art as therapy. 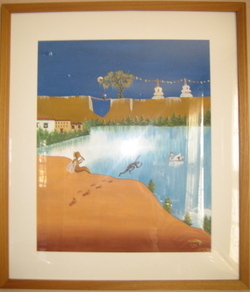 We decided almost without discussion to purchase two pieces, this one, "Life is a Dream," and the one at the end of this post. 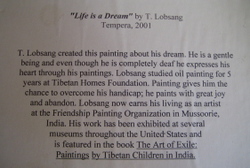 We chose "Life is a Dream" because we liked it and because it was painted by a young boy, T. Lobsang, who is completely deaf. My hubby was born on this very date 64 years ago with a 60% hearing loss in both ears. Enough said. Beneath the painting, which hangs in our living room, is the small plaque that was on the gallery wall, explaining more about this talented young man. 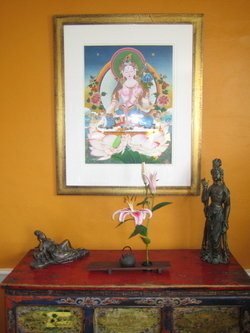 We also chose a second painting, White Tara, the female Buddha associated with compassion and long life, because it was painted by the children's art teacher, Sonam Choephel. The original, which this photo can't possibly reflect due to my limited photographic skill, is exquisite and hangs in our dining room. It's especially meaningful because some years ago, Sonam Tsering, the father of our friend Phuni Meston, came to our house for dinner and said prayers in front of it. Sonam, a Tibetan nomad who fled his country after the Chinese occupation and lived for many years in India before joining his daughter and son-in-law here in Boston, passed on in 2005. I think of him every time I walk through the dining room. It's no secret to my readers that I admire the writing of Roland Merullo (a dozen posts here, scan for his name) and so tonight I will be among those listening to his reading from Breakfast with Buddha, which I first blogged here: Porter Square Books, 25 White Street, Cambridge, Mass, 7 PM. Few writers have the range with language that Roland does. Or with emotion. Or with the contemplative life. This book is funny, one of the acceptable ways, so far as this reader is concerned, to grapple with matters of deep spiritual consequence. If you're one of the hundreds of millions (possibly billions as we're up to, what, 6.7 billion hum beans at this point) who has meditated, done yoga, thought about the meaning of life, hungered for something deeper, read a book about how to be happy, or gone to a lecture about Buddhism/Christianity/Judaism/Jainism or whateverism, you want to read this book. Cheerfully, laugh-out-loud funnily, and poignantly, Roland takes his main character, Otto Ringling, from loving family-man and NY publisher to the edge of enlightenment with a cross-country journey that stops for sausage, bowling, and slot machines. Otto's love for his wife and family are enough to make this book worth the read--few fathers in literature are so bold in their pronouncements--but when you include his very light but profound understanding of human nature and the meaning of existence, you have a treasure. And, oh, his uninvited passenger is a spiritual master, a Rinpoche in robes. Write on, Roland. I can't wait for the next one.